When you open a file, you copy it from your hard drive (or other storage location) into the computer’s memory, where Word 2013 can access it for viewing and modifying it. You can open an existing document or start a different type of document using one of Word’s templates. In Word 2013 the Open dialog box’s navigation controls are almost exactly the same as those in the Save As dialog box, so you can browse to a different storage location if needed. If you want to reopen a recently used file, there’s an even quicker way than using the Open dialog box. Choose File→Open and then click the file’s name on the Recent Files list. 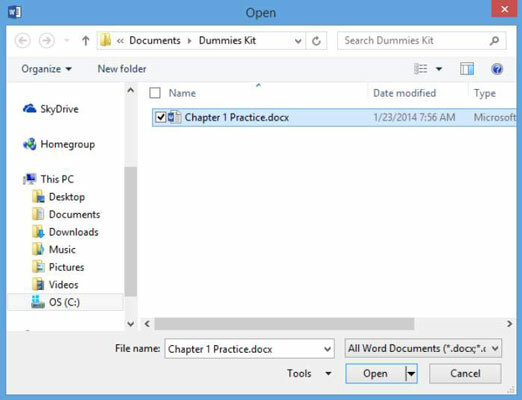 In Word 2013, at the top of your screen, choose File→Open. Click either Your Name SkyDrive or Computer, depending on where you chose to save in the previous exercise. The Open dialog box appears. The location shown is the Dummies Kit folder because it was the last folder you accessed during this session. Click on a Word file to open it. In this example, a practice document was selected to be opened. The file opens in Word. Choose File→Close to close the document without exiting Word. A list of you most recently opened files appears on the right side of the screen. Choose File→Close to close the document again.